Plaas staff had many reasons to be familiar with the ADM plant in Columbus, Nebraska. This plant processes corn into feed, fuel and other food products. Plaas staff worked to expand this site in 1995 (when it was Minnesota Corn Processors) doing a variety of mechanical contacting work. In addition Plaas Project Manager Paul Katzenberger helped build the ethanol or dry grind side of this massive site in 2007. In 2014 Plaas crews were called to Columbus again, this time to help increase the flow to the scrubber by upgrading the pipe size. 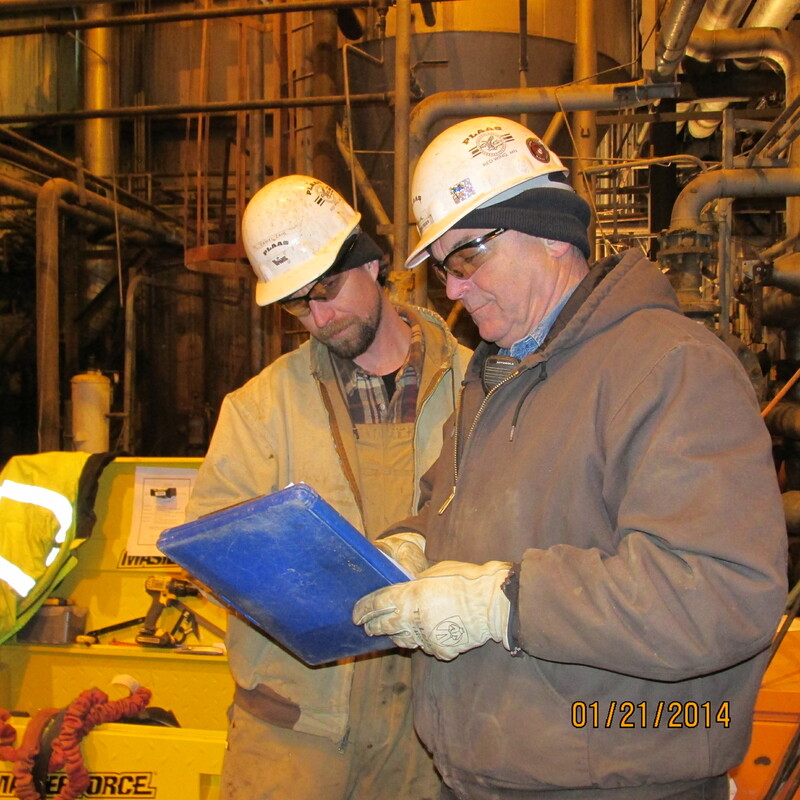 Project Manager Paul Katzenberger led this CO2 Upgrade on the Dry Grind or Ethanol side of the plant. Plaas started with a 6 man crew in August and the project was recently completed on time, just before Christmas. 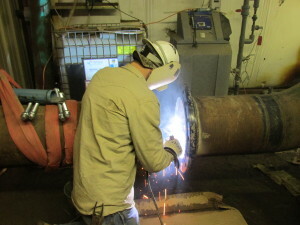 A total of 1800 ft. of 48” pipe was installed, replacing the 36” of pipe that was there. In addition to installing the new pipe and demoing out the old, Plaas staff also made a variety of modifications to the plants steel supports. Although done with the assigned CO2 upgrade task, ADM staff asked Plaas staff to stay a while longer to assist with other maintenance projects at the site. At the site of a former Owen’s Glass Factory in Bridgeton, New Jersey, Plaas staff were assigned the task of building the support structure for a Waste to Ethanol pilot plant. Led by Site Superintendent Tim Davis, Plaas has had crew on site since February 2014 and work is on-going. Since February Plaas staff have installed over 8000 ft of process piping and created and installed iron work and steel supports through-out the site. 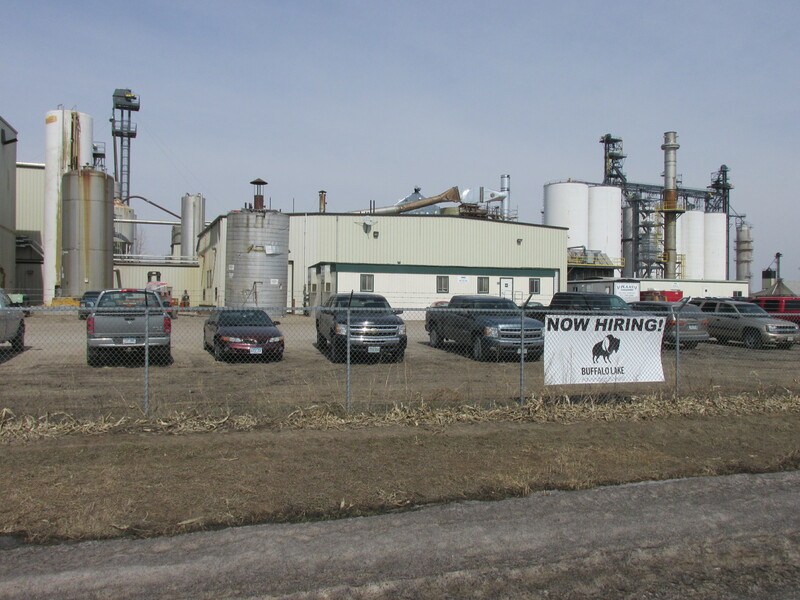 The site had been vacant for almost 30 years and will eventually produce 3 million gallons of ethanol/year with the potential to expand up to 10 million. The source for most of the fuel will be solid waste from Bridgeton and regional fruit plants. Diverting municipal waste from landfills to make fuel-grade ethanol is a win-win for everyone and this will be only the 4th commercially sized Biorefinery in the US that only uses food waste. Ethanol has now replaced over 10% of the nation’s fuel supply with a cleaner burning and renewable source. The US and Brazil account for 85% of the production of the world’s ethanol supply. Longtime Plaas customer Valero Energy Corp., gave Plaas a tall order in the fall of 2014 requesting Plaas staff to play a key role in four fall shutdowns that all ran sequentially. 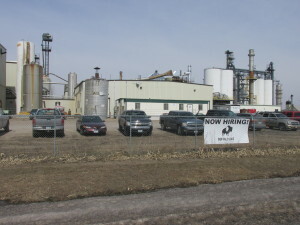 Each one of these Valero Ethanol sites (Welcome, MN & Fort Dodge, Hartley and Albert City Iowa) offered unique requirements and different mechanical contracting jobs. The timing and scope was worked out and doable if everything went according to the plan, but the plan rarely includes discovery work. Each one of these outages found problems that were “discovered” during the shutdowns and added technical and manpower challenges to each site. This discovery work threatened to delay completion of the outages but Plaas staff were prepared for the unexpected. At one site, discovery had uncovered an economizer that needed to be re-tubed. Plaas staff were able to work around the clock on the tank in-place and use their NBIC accreditation (required special State approval) to get the job done just one day over the regular outage day and ended up saving the plant weeks in downtime. Plaas is looking at an extended Valero run for turnarounds at various ethanol sites in spring 2015. 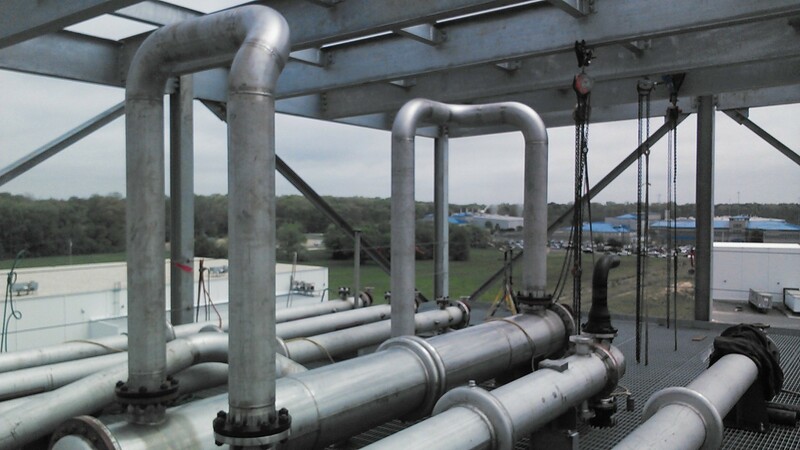 A key customer recommendation recently allowed Plaas Incorporated to prove themselves to Tenaris (a leading supplier of tubes and related services for the world’s energy industries and other applications). Tenaris was looking for a new Mechanical Contractor and the customer recommendation opened the door for Plaas (Mississippi Office) to bid a project with them. The first Plaas’ project bid for Tenaris was not selected, but it led to a second bidding opportunity which was accepted. 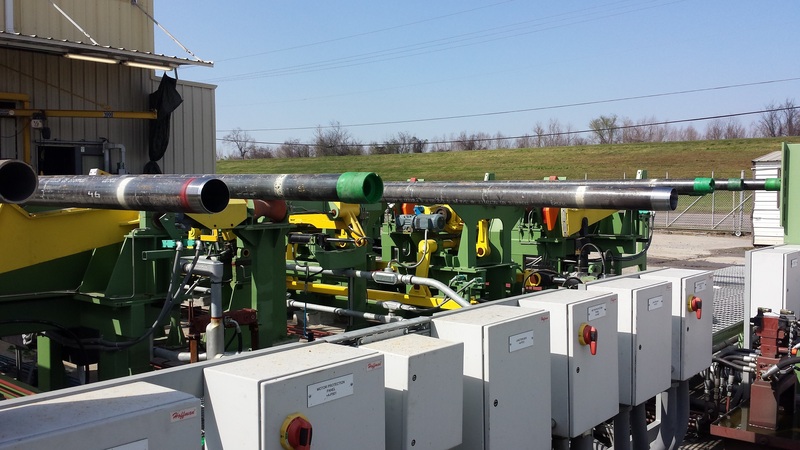 At its Westwego, LA facility, Tenaris had designed and purchased a new pipe threading line that could thread pipe up to 18”. The new custom unit was built in Europe and Tenaris engineers went to Italy to see the entire system put together. The unit was then broken down into 4 boxes for shipment to the States. Tenaris required precision millwright services to get the rollerbed racks, kicker arms and entire unit level and functional. With the plant’s threading unit down, speed was important to get this facility back to operational. Under heavy time constraints, Plaas was hired to reassemble the threading machine and get it operational in four weeks. Tenaris staff blocked off a section of the parking area to allow for assembly of the large machine. 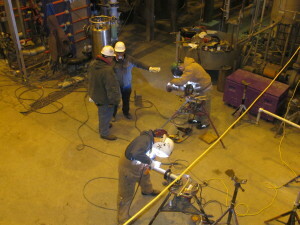 Plaas technicians worked with Tenaris engineers to set-up and operate the new threading line. The unit was operational ahead of schedule and immediately after that, the Plaas crew were scheduled for another similar installation at another Tenaris site. Watch Plaas Buffalo Lake Biofuels Video by Clicking Here! -Improved Mash coolers, distillation and fermentation process.